Our App, available for various Android phones and iPhones allow consumers to authenticate products anytime, anywhere. ZorSecure™ is a scanning app used to authenticate items which have had a ZorSecure™ Label applied to them. A ZorSecure™ Label allows for authentic products to be individually tagged and later authenticated by anybody at anytime and anywhere. These labels contain a pairing of a unique barcode and a unique random 3D pattern. By scanning such a label, the ZorSecure™ app can verify the authenticity of item to which the label is affixed. The counterfeiting of items is a large problem throughout the world, affecting consumers, retailers, manufacturers, and government entities. 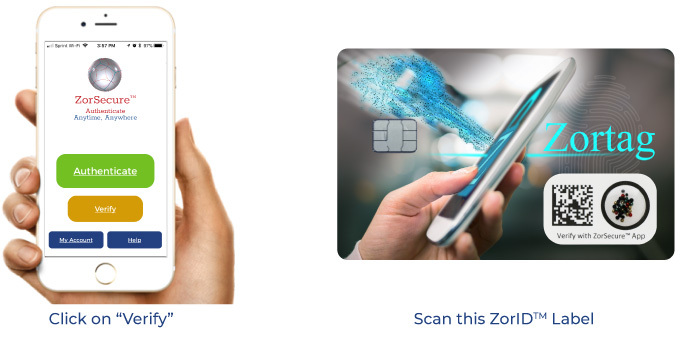 The development of the ZorSecure™ technology puts the power to authenticate individual items in the hands of consumers, allowing them to verify at the point or purchase whether or not the item they are about to buy is indeed an authentic brand product. ZorSecure™ has been developed for use exclusively with our proprietary ZorSecure™ Labels. It is not a general purpose barcode scanner and can be used only to read a ZorSecure™ Label. Now that you've downloaded the ZorSecure™ App, test it out on the card below!